Original article (in Word .doc format) can be accessed at www.clintdarden.com. Article published on OntarioStrongman courtesy of Clint Darden. 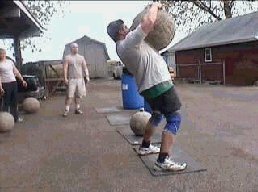 The Atlas Stones have long been the corner stone event of Strongman, as everyone seems to relate to it because they have seen it on TV. I must admit that the stones have been one of my best events since I began training for Strongman. 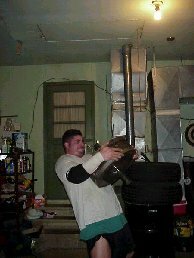 The first time I ever touched an Atlas Stone was in 2001 at my first contest. I had already purchased tacky and arm sleeves but had no idea what to expect. 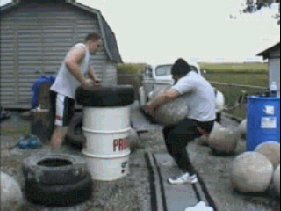 I was finally successful at loading the 300-lb stone as a 4th stone and it was one of the most painful things that I had ever done to that point. If you want to be good at the stones, you are going to have to be strong in several areas. You must have a strong back from top to bottom and from left to right. You must also have strong glutes, hams, hips, quads, abs, rear delts, biceps, and full of attitude. All of these can be strengthened in the gym. With this in mind, there are two ways to get better at the Atlas Stones. You need to spend time strengthening those areas in the gym and you need to spend time training with the stones. I use several different exercises in the gym to bring up my stones. Of course I always work to increase the strength of my entire body all the time, but I have always been able to tell that a few exercises (when left out) had a negative effect on my stone strength. I have been doing box squats with bands for the past 2 years and every time I take the bands off the bar, my stone strength consistently goes down. The box squat itself focuses on the body's ability to be able to come to a dead stop and break off of the box similar to how the body will have to break the stone off the floor from a dead position. With the wide stance box squat, like I do, it also puts emphasis on the back, hamstrings, hips and glutes. All of these are very important in getting the stone from the ground to the lap. The use of bands teaches the body to drive off the box very quick and with a sense of urgency. When using lots of band tension if you do not drive off the box with lots of intensity you will not make the lift. This is also very important with the stones. The bands can be purchased at www.elitefitnesssystems.com and they also have lots of articles of how the bands can be used for the box squats. I normally train with anywhere between 275 and 405 + bands for 5-8 sets of 2 reps with 45 seconds rest between sets when I do my box squats. Also, I do not wear a belt when I do these. I have found that the good morning has helped my stones, especially with the heavier stones. The many different variations of good mornings not only allow you to focus on your weakness but it also allows you to use a variety of exercises to keep it exciting and the PR's coming. To increase my stones I will often do them with a stance similar to how wide it would have to be when picking up a 300-345 stone, which is about 6-12" wider than shoulder width for me. I would pick 3-4 different width stances, which suit you best. I have a close (shoulder width or closer), stone stance or medium width, and wide stance (my squat stance and toes are about 54-57" apart). For the most part I will do these chain suspended at 40". I hang my bar from the power rack with chains and start from complete bottom position. This is also an amazing exercise for increasing the deadlift, tire flip, picking up the yoke, etc… The height that I use, 40", is the same position that my body is in when I bend down to pick up the deadlift bar (if you placed a bar across my back at the start of the deadlift). I have tried going deeper on these (similar to how it would be for a stone) but I did not find that it was beneficial to me at all. The main things with chain suspended good mornings is to keep your shins straight up and down or knees behind your ankles. Do NOT use your quads to break the bar from the chains. Don't worry about bending your knees when doing good mornings. As long as your knees are not moving forward, you should be fine. Always think that the ONLY thing that moves is your hips and they shoot forward. These can be done with all kinds of stances, rounded back, arched back, with bands, with chains, for reps, for a 1-5 rep maximum, or with any variation that you can think of. Try them all but always remember to focus on getting stronger and coming out of the chains hard and fast. Think about trying to be as explosive as possible while keeping good form. Last, but not least, remember that when going really heavy and hard, your form WILL break some. This is where it is very important to make sure that you DO have a strong back and entire core. I would not go hard or heavy on these till you are positive that you have them down perfectly and a confident with your core strength. I do not wear a belt when I do these as I use them to strengthen my core. In 2003 I started doing SLDL's as a way to bring up my stones. I noticed that when doing the stones I was straightening my legs out near completely on the way up with the bigger stones (345 and up). From there I decided to keep the SLDL in my routine every 3-4 weeks and do them hard and heavy. I found it very important to keep my knees as straight as possible (not always completely locked), head up, back arched tightly, make my arms as long as possible, and ONLY take the bar down to about mid-shin or to the point where I was about to lose my arch. I suggest using the rep range of 1-5 and not using a belt, just as I do with the actual stones. I have always done barbell rows since my first year or two of training. For the stones, I have found that doing them overhand grip and with either a medium or wide grip has worked best for the stones. A wide grip for me is my pinky on the power rings and medium is about 2-3" closer than that. I bend over to about 45 degrees and row the bar to my belly button or slightly above while keeping my head up and a tight arch. I don't worry too much about jerking the weight a little but I make sure that I'm not jerking the weight to an extreme amount. Normally I'll choose to either go heavy on these (2-5 reps) for 2-3 sets or light (10-15 reps) for 3-6 sets. I have been doing these since March of 2004 and simply love them for my stones. The heaviest dumbbells that are in the local gym that I often train at are 120's so I will normally do a warm-up set with a 50 then jump straight to the 120's. Often I will do 3 sets of 10-20 reps with them or I will do them to failure and them drop straight to either a 100 or an 80-lb dumbbell. Variety is a great thing in training, no matter what you are training for. This is an exercise that I do to strengthen my upper back and rear delts to help me with my pressing as well. I will go to a cable machine and attach a rope attachment to it, put the ends of the rope between my fingers, stand back a few feet and bend my knees (feet 2x shoulder width apart) and pull the rope to my face and spread my hands to about 12" apart. I try to think that I am pulling with my elbows to really use the rear delts, upper back, and traps. Doing these in the 6-15 rep range really help with loading the stones to the taller platforms when you really have to lean back and pull the stone high up on your chest. 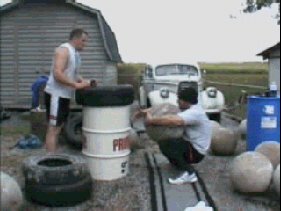 I have never been a big fan of doing curls and I thought that when I started training for Strongman that doing events like the tire flip, Atlas Stones, Conan's wheel, and the log press would be fine. I have also had lots of bicep pains from doing events. Since March of 2004 I have really started training my biceps and I found that they are a big weakness for my body. The standing barbell curl is often painful on my elbows and wrists but I will still do them when I can. I will also do dumbbell curls both standing and seated with several different variations. I will do them with my palms upwards most of the time but will often also do them with palms facing, often called a hammer curl. Reverse curls with a bar has also helped to improve the strength of my biceps and forearms and I will often use a 2", 2 3/8", or 3" bar for these. When I have one available, I will actually venture over to the preacher curl machine, especially if the handles rotate. I think that these have really helped with my bicep tendonitis as well as with the events. I always try to go fairly heavy (5-8 reps) on all curls but sometimes will do a set of 20-25 reps.
Every time that I have missed a VERY heavy Atlas Stone I have felt my abs cramp up and they will be sore the next day. That is a big indicator to me that I need to strengthen my abs from all directions. The abs should be trained with every variation and variable possible. Heavy, light, high volume, low volume, standing, seated, from all directions, twisting, etc… For the most part, I will do my abs standing while using a pull down machine or bands with different stances and resistance. I will also do what is called spread-eagle sit-ups. I will lie down in the floor between my rack and spread my feet wide and turn my toes outward so that they hook behind my rack. While keeping my knees straight and pushed down against the floor, I will sit up all the way. Sometimes I will curl my abs into a ball and head down and other times I will try to pivot only at the waist and keep my head and chin high in the air. Doing these with weights or while holding a band behind your head will make them extra tough and effective. When one is available, I will use the hyperextension machine except I will lay face up and do sit-ups on it. I try to go as deep as possible while being under control. Another good ab exercise is the hanging leg raise where I will hang from a chin up bar and raise my feet up as high as possible and lower under control. Using heavy dumbbells for side bends can be very beneficial as well. Hold one heavy dumbbell in your hand and stretch down to one side while using your other hand to push in on your other oblique. Use that oblique to pull you back up for reps. I mostly train my abs in the 4-12 rep range and from all angles, 3-4 times per week. When trying to get better at the stones it is easy to become very frustrated with their lack of progress. To start off with, you need to spend time with your hands on the stones on a regular basis. You can do all the work in the world in the gym to prepare yourself for the stones, but you have to spend time doing the stones and working on technique to become really good at them. Learning the technique is normally difficult for the beginner and I have seen very many people become frustrated that they can't even budge a very small stone, much less load it. As soon as they find their proper technique they start to laugh that they had even the slightest problem with the smaller stones. 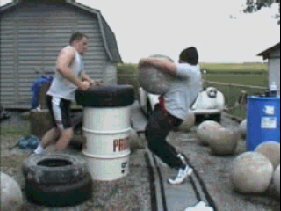 Everyone has a different technique for loading stones. Phil Phister likes to load the stones while being at a 45-degree angle or so to the platform and making a slight twist as he loads them. I've seen shorter people who have to shoulder the stone and press it to the platform. Many people load the stone in one motion. I highly encourage you to try every way possible till you find YOUR way of doing the stones. I have always believed that there is a "best" way to do an exercise and then there is the way that YOU do the exercise the "best". It is always good to strive towards having the best technique, but when performance is on the line at a contest, do whatever works best for you. For myself, I will face the stone and place my feet to where my calves are about 1-2" from it. My toes will point outwards just a little and I stand directly over the stone and straighten my arms straight down towards the center. I will round my back, squat to near parallel (never deeper) and try to get my fingers as far under the stone as possible. While squeezing the stone with my fingers, hands, forearms, and biceps (for bigger stones) I will pull with my entire back and legs. My knees will straighten as the stone begins to rise nearly like a Stiff-Legged Deadlift. As the stone passes over my knees, they will bend quickly and I will set the stone into my lap. I like to sit down into a full squat from this position and I can actually let go of the stones with my hands and it will rest on my knees and against my chest. From this point I will move my hands from the center of the stone to about the 45-degree mark on the top of the stone while making sure that it is pressed tightly against my upper chest and my chin is as far over the stone as possible. I squeeze the stone, pull back with my arms and upper back, stand up while shooting my hips forward, and as the bottom of the stone clears the top of the platform, I will lean forward and try and shoot the stone off of my chest. It is very important as you are reaching the "stand-up" position with the stone to keep the center of the stone directly over your heels. Your hips will shoot forward and you will lean back to keep balance with the stone and your body. Here is a series of pictures with me putting a 365 stone onto a barrel. Over the past couple of years promoters have worked to find a way to make the event a tougher one by using different heights of platforms. It is not uncommon to see a platform that is 60" or better so I highly encourage you to train with taller platforms. When going to the taller platform it is very important to have such explosive power out of the bottom position so that it will carry you all the way to the top of the platform without a sticking point. This is also where it helps to have a very strong upper back because you will have to squeeze it very tightly and lean back even farther to take it to a higher platform. I have a 61" platform that I train with every week and I load all my stones to it. When I get to a contest and the platform is 54" (as they are using in a lot of the Pro contests recently) the extra height is not a problem for me. Now that you have an idea on what kind of technique to use, lets look at the many different ways to train for the stones. As with anything, if you are new to the event or the exercise I suggest doing the exercise 2-3 times per week VERY lightly and working on technique only. For a beginner, I would work with a stone well under 200-lbs. If you have access to something in the 150-180-lb range that would be best to train with. Take your lightest stone and load it for 1-3 sets of 5 reps, 2-3 times per week. This will help you for the first few weeks while you work on technique as well as preparing your body for the heavier stones that you will be using in the future. Most often in training, I will set up my lightest 4-8 stones and load them to my tall platform in a series. I will try to load them (160, 185, 190, 230, 245, 265, 285, 310) as quickly as possible and I will work on not making any mistakes. You will quickly learn than a single mistake on any stone can easily cost you valuable time or even loading that stone. A mistake can be very costly and often the struggle of making the mistake is harder than actually loading the stone. Learn the technique and continue to work on it so it becomes second nature to you. 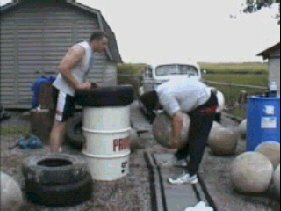 Remember that it is nearly impossible to learn perfect technique while training with heavy stones. As a contest nears I will also add in a series of conditioning work and a building phase. I will pick a lighter stone for me to use for conditioning. I may grab the 245 stone and break it down into 3 sets of 10 reps. The first 10 will be a cradle and squat as high as I can then I'll take it back to the ground and repeat. After this, I will rest for 3-5 minutes, as it is very taxing. My second 10 will be one cradle and 10 squats as high as I can, bringing it back to the cradle position between every squat. Again, I will rest another 3-5 minutes. My last 10 will just be the cradle position. I will cradle it then just drop it back down between my legs again. This alone is very taxing so start with a very light stone the first time, as it surely will leave your entire body very sore. The last few weeks before a contest I will take my 365 stone (which tends to be much tougher than any other 365 I've ever used) and I will cradle and squat it for 5 repetitions in 75 seconds. This is often very tough for me, as I must not make any mistakes, have the strength to do the 365 stone 5 times, and be mentally tough to push myself to get the last rep in time. Here you can see me doing my last rep with my 365 stone for this series. During the last week or two before a contest I will set up something as close as possible to contest conditions and make a series run. Again, I will use my 61" platform to prepare myself. Always remember that your last session of training before any contest should be a "safe" one. It is better to do a light series than something heavy and risk any injury. When not training for a contest I will do many different things from shouldering stones, walking with stones in a medley, carrying and loading stones to my platform, and any other variation that I can think of. If you do not have a set of stones and are looking for a way to simulate them you have a few options. One option that I used when I first started was taking a piece of schedule-80 pipe about 18-24" long and 2" around and putting a series of 45-lb plates on it while securing the ends with strong collars. It would look similar to an Atlas Stone and was good enough for me to start with. Here is an old picture of how I set mine up and used it before I had stones. Remember in your training that you are having fun and just about everything works. Also remember that nothing works forever, so keep changing things up. Everyone has to find what works for them and the only way to find that is to try it and evaluate if it is working for you. Finally, one of the biggest parts of my success in Strongman has been my planning. I keep a log of my training, a series of goals, as well as a typed up plan of what I expect to do in my training. When a contest nears (and if I am injury free) I will plan my workouts for up to 10 weeks at a time. Quite often things do not go as planned because I will either have a bad day or a really good one. Type it up and print it out with as many details as possible. You never want to look at the calendar and realize that you only have three weeks to get ready for your contest and you haven't really become serious about your stone training yet. Either be prepared or prepare to fail, it is your choice. Have fun with your training and remember that you should always share your knowledge and learn from everyone. There is a world of knowledge out there if you never stop looking.